I think I have turned into a mithai-wala (person who makes sweets) these days. Everyday my hands are itching to make new sweets in the kitchen. The reason is obvious, it’s Diwali in few days and I just can’t seem to stop myself from trying out new recipes. I am also getting very homesick these days, happens with me always during this time of the year. I am missing mom and dad so much, I wish I could be there in India with them. Here I make so many sweets but there’s no one to eat, in India these will be over in few hours! What an irony, when I was in India I didn’t know how to cook and now that I know I am not there. Making sweets for Diwali brings back so many memories. All year we used to wait for Diwali for it meant new clothes, decorating your home, lighting candles, eating sweets and bursting fire crackers. When I was a kid, we didn’t really have play-station and iPad, all we had was these festivals to have fun and roam around. I don’t think kids today are as enthusiastic about Diwali as we were! I think now I’m sounding like a grandma, so I’ll stop! 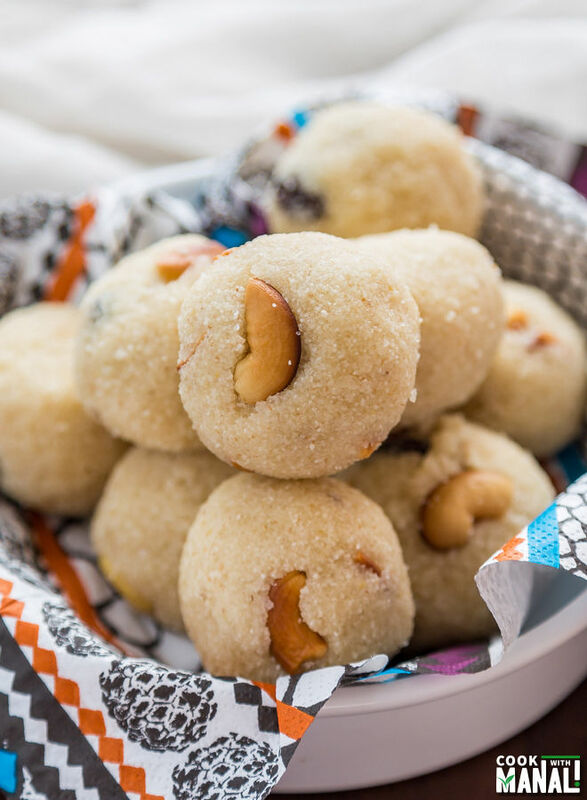 Sooji or rava ladoo is one of the easiest Diwali sweet that you can make in few minutes. These are sweet balls made using semolina (sooji/rava), ghee (clarified butter) and sugar. 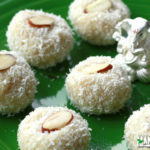 Ladoo is the Indian name for any sweet which is round in shape! 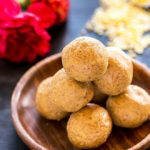 For making this ladoo, you first need to roast the sooji, stirring it continuously. Semolina burns very quickly once it’s hot so you have to keep stirring continuously on medium heat. You will know it’s done when you start getting a nice aroma from it. Powder the roasted semolina, powder sugar with cardamom and mix them together. Add some ghee and milk and make ladoos. It’s really that simple! In a pan heat 1 tablespoon of ghee on medium heat. Once hot add the sooji (semolina) and roast it stirring continuously till you get a nice aroma, this will take around 6-7 minutes. Please remember to keep stirring because sooji once hot can burn very quickly. You don’t want it to stick to the pan. Once roasted, set aside and let it cool down a bit. In another pan, heat 1 teaspoon of ghee on medium heat. Once hot, fry the cashews and raisins in it till nice golden brown. Once the sooji has cooled down a bit, grind it using a blender. Transfer to a large bowl, also add the fried nuts. In a blender, grind together granulated sugar and cardamom seeds. Mix the grind sugar into the sooji and nuts mixture. You can save some nuts to garnish at the end. Add 3 tablespoons of warm melted ghee and mix. Also add 1-2 tablespoon of milk. Take a small amount of mixture in your hand. Press it with your hands and from a round shape of a size of a golf ball. 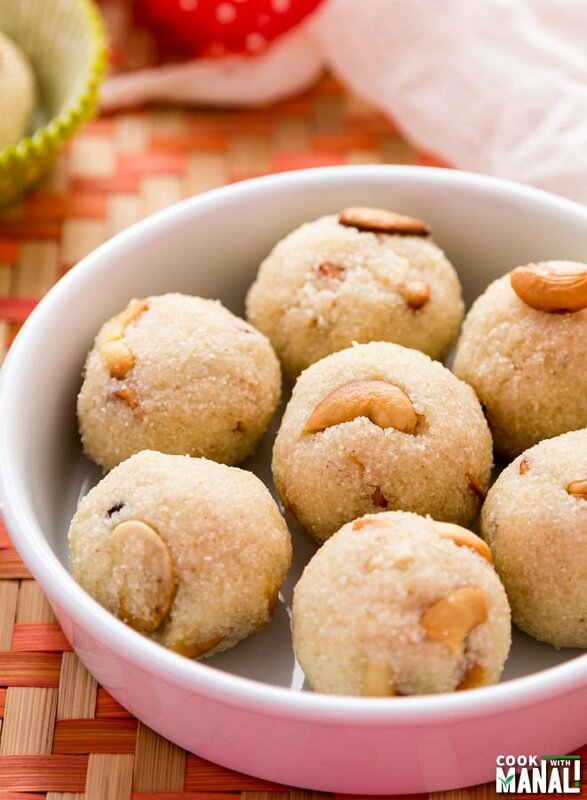 If you are not able to form a ladoo, add 1 more tablespoon of milk. Repeat the process till the mixture is over. I was able to get 12 ladoos out of this. Garnish with nuts [optional]. 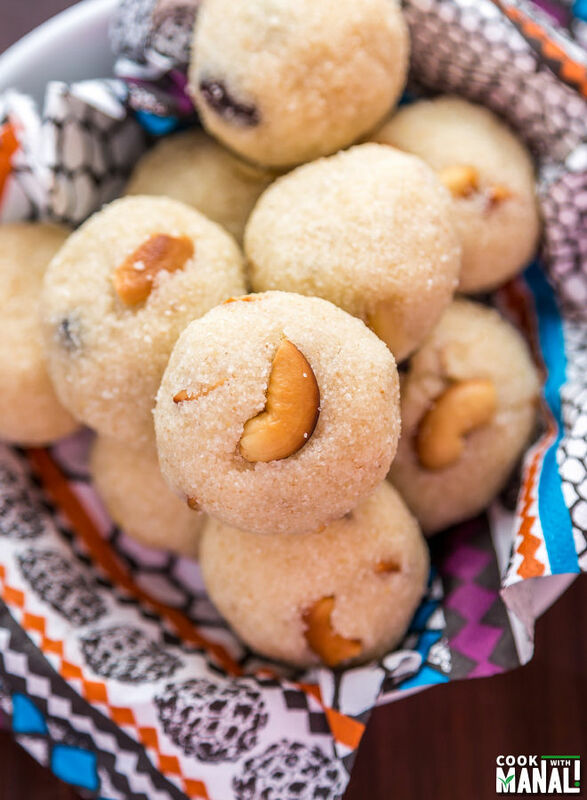 Ladoos stay fresh at room temperature in a airtight container for a week easily. * Add milk little by little. Initially add 1 tablespoon and try to see if you can shape the mixture into a ladoo. If not, add 1 tablespoon milk more. * A lot of people add shredded coconut to the these ladoo. Add 1/2 cup of coconut if you want to, it really makes them more delicious. * You can use any nuts of your choice. 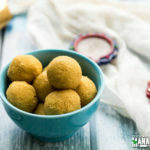 Indian sweet balls made with Semolina, clarified butter and sugar. In a pan heat 1 tablespoon of ghee on medium heat. Once hot add the sooji and roast it stirring continuously till you get a nice aroma, this will take around 6-7 minutes. Once roasted, set aside and let it cool down a bit. Repeat the process till the mixture is over. I was able to get 12 ladoos out of this. These cookies look and sound amazing!! 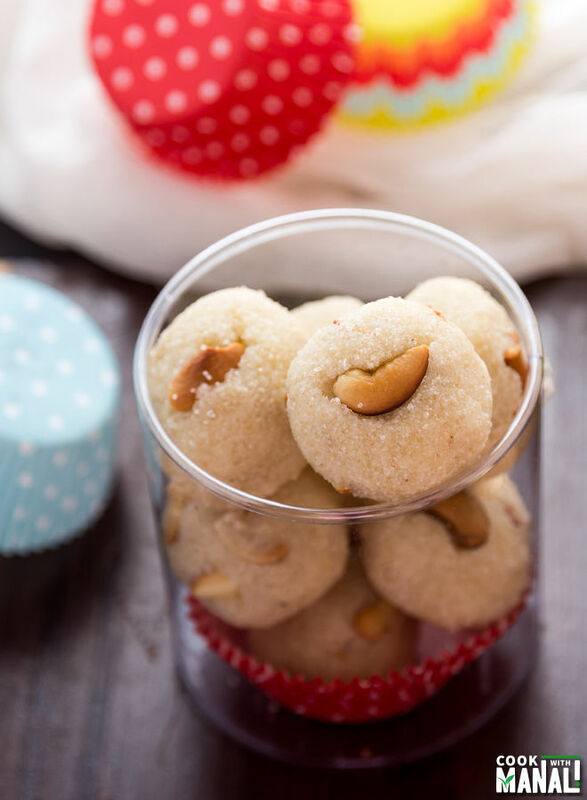 The combination of ghee,cardamom and cashew sounds heavenly! 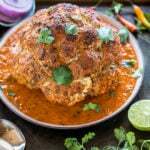 you may roast some more soooji , mix with the ladoo mixture and try to make ladoo again. Add more ghee in place of milk while binding the ladoo. Thanks Mira! yes that’s the sad part isn’t it? I wish I knew how to make all this when I was in India! Thanks Renee! I wish I could be with my family during Diwali, I really miss them. I love reading your stories about India and the Diwali celebration — it sounds so special! It’s wonderful that you can make these beautiful, sweet treats here to get a taste of that celebration. These look so delicious! Thanks Priya for the kind words ! Thanks Gayle! 🙂 making sweets makes me happy, only wish I had people to eat it! I love desserts like this as I love cardamon. One of my favourite spices. 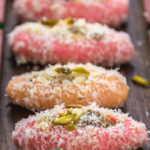 Cardamom is used in every Indian dessert Dannii! You are fantabulous cook. Please post some more for our activities. Thanks Saksham! 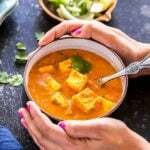 🙂 Sure, I update by blog every week with new recipes, please subscribe to the newsletter to get notified! Hi use hot milk or cold milk pls explain thank you. room temperature milk, the ghee has to be warm! Thank you 🙂 they will be okay for 5-7 days in the refrigerator…even more if you don’t add milk! 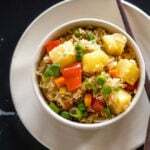 Thanks a lot for the receipe…it came very good.As you told, I was adding one by one tablespoon of milk and was checking the consistency to make the laddu.Since I used 1.5 tablespoon of ghee at the end, may be it required 6.5 tablespoon of milk to make those laddus. My mom got suprised since I dont know cooking at all. 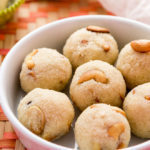 This is my second sweet preparation.The first one was rasamalai , which I did following your blog only.The details you gave were so clear that the consistency and the softness of the sweet balls came very good.I even got suprised when it came good!! I struggled a little with amount of sugar I needed to add for the kheer. 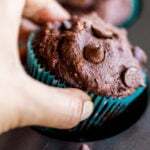 And, on behalf you, your blog followers get people to eat and appreciate us.So indirectly its you, getting lots of people to taste and appreciate the taste of sweets through us.! I am so glad to hear that Srividhya! 🙂 Keep cooking! Your ladoos were wonderful! I made them for my family. I’m so sorry yours is not here with you. Will you get home soon to visit? Please continue your blog. It is so special to read. Lovely, made to have as snacks for kids. This recipe sounds very easy; I want to try. What if the rava is not ground. Will it still work? What do you mean by rava is not ground? I am use the regular rava only that we get in market..